U.S. special operations forces, long overtaxed by 16 years of war, are getting a bit more time between deployments, component commanders told lawmakers Wednesday. The Pentagon’s goal of having active duty troops spend just one day deployed for each two days at home — what it calls a 1:2 dwell ratio — remains largely aspirational for most of the services. But the leaders of the Army, Air Force, Navy, and Marine special operations commands told the Senate Armed Services Emerging Threats subcommittee that the Preservation of the Force and Family program had helped put them on more a sustainable trajectory. The Army Special Operations Command, for example, “is on [a] glide path to achieve the [Defense Secretary’s] directed 1:2 deployment to dwell ratio by the end of 2018,” wrote its commander, Lt. Gen. Kenneth Tovo, in submitted testimony. The Air Force is also working to meet that goal. Currently “I have 12 percent of my force that is below a 1:2 dwell. None that are below a 1:1 at this point,” said Lt. Gen. Marshall Webb, who leads Air Force Special Operations Command. Parts of the Marine Corps Forces Special Operations Command force are at a higher operational tempo, but it’s “manageable,” their commander said. But even as the services make strides, there’s still an accrued exhaustion in their special operations units. “At this stage in the ongoing counter-violent extremist type of fight, it is not a rare exception for airmen to be on their 12th, 13th, or 14th deployment,” Webb said. 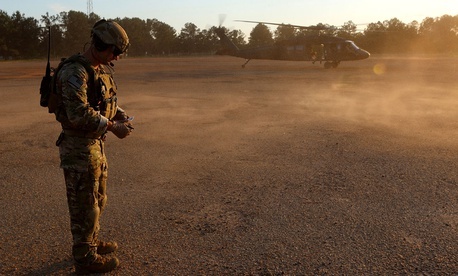 Just last year, Owen West, then the nominee for assistant secretary for special operations and low-intensity conflict, told senators during his confirmation hearing that it was time to re-evaluate which missions got assigned to special operations forces. At first blush, the U.S. Army’s new Security Assistance Force Brigades may seem a great fit for reducing demands on special operators. But that’s a long way off, Tovo said. The first SFAB deployed to Afghanistan earlier this year, but they’re advising conventional Afghan troops — a mission the Army special forces didn’t have. USASOC is an “indirect beneficiary of that,” Tovo said, because now there will be a stronger conventional force to hold territory that his troops liberated with Afghan special operations forces.